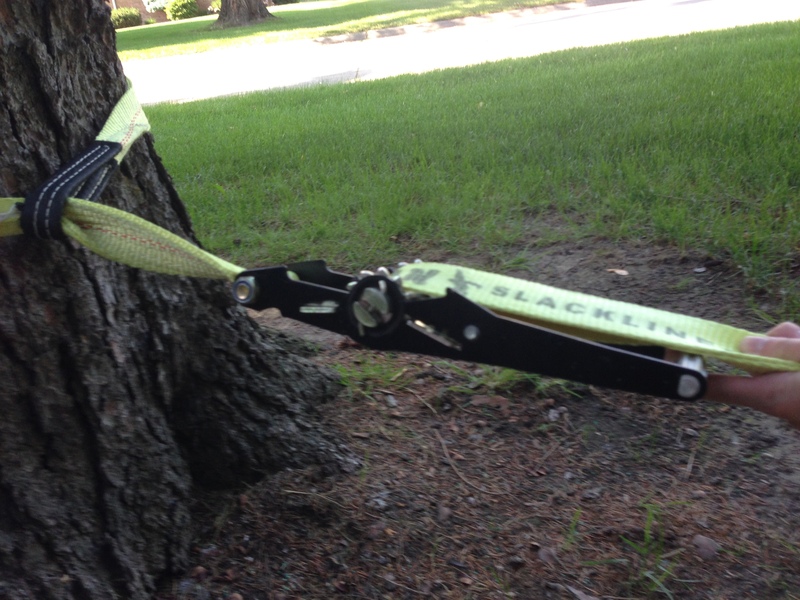 When beginning my journey of learning to slackline, I anticipated that it would be difficult. 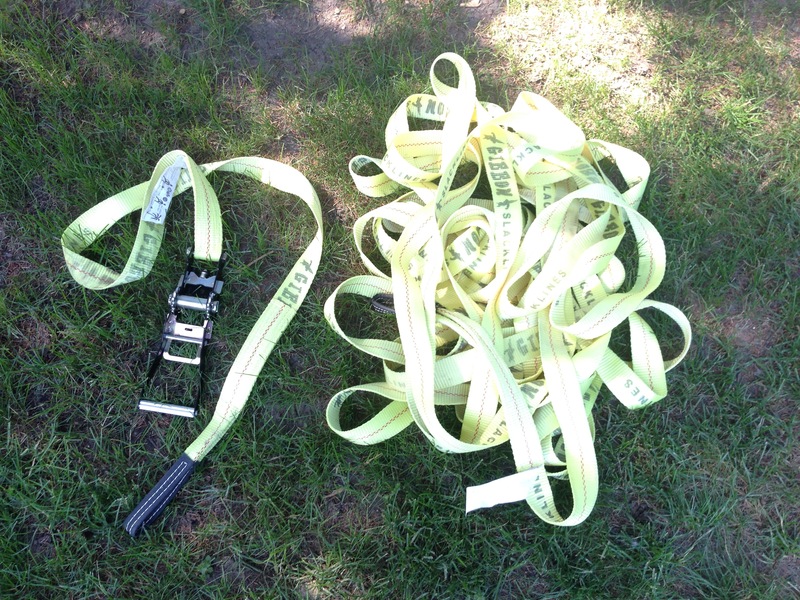 However, I did not think that setting up the actual slackline would be as hard as it was. I followed this tutorial video, created by the Gibbon Slackline company, very carefully when I began setting up my slackline. I chose this video because I thought that the company that created the slackline would have the best tutorial. The first step is to wrap ratchet around tree. I learned from the instructional video that I had to fold the line into a “U” where it crosses through the loop to ensure the slackline lies flat. 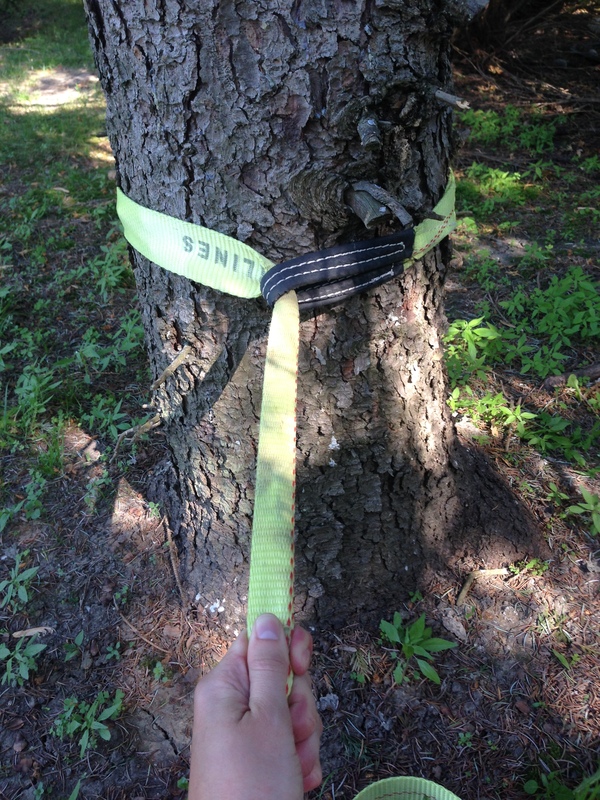 Next, I wrapped the actual slackline around another tree. Like in step 1, I folded the line into a “U” where is crosses through the loop so the line lies flat. 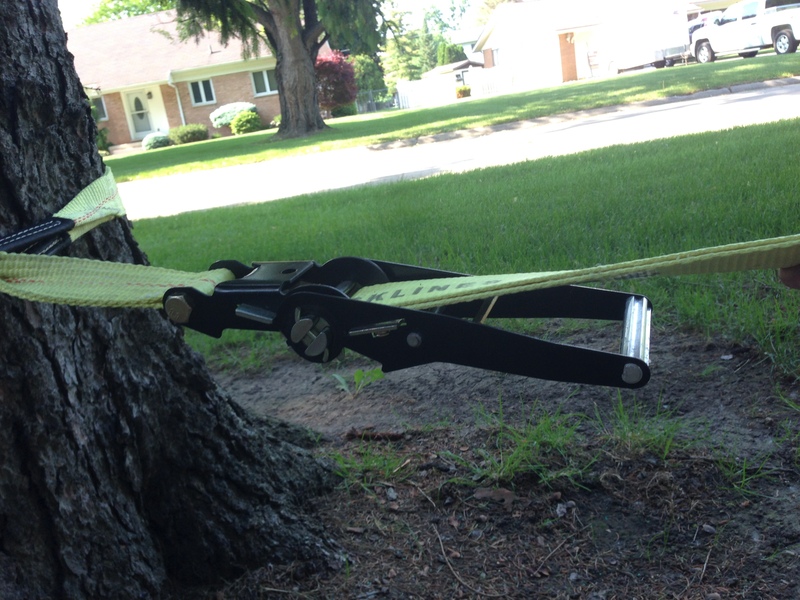 The next step involved threading the slackline through the ratchet. This is where I ran into some problems. On my first attempt, I threaded the line through and it was twisted, despite my best efforts to ensure it was straight. After tediously unthreading the slackline from the ratchet, I tried again. This time I untwisted the line, then stepped on it with my foot to make sure it stayed straight. This time, I watched this video tutorial that showed how to thread the slackline through the ratchet it a little closer than the last video. I thread the slackline straight, but I realized I had the ratchet upside down. After unthreading the slackline from the ratchet (again), I tried threading the slackline for the third time. I turned the ratchet over and threaded the line through once again. Third time’s the charm! I finally managed to thread the line correctly, then proceeded to ratchet it until the slackline was tight. 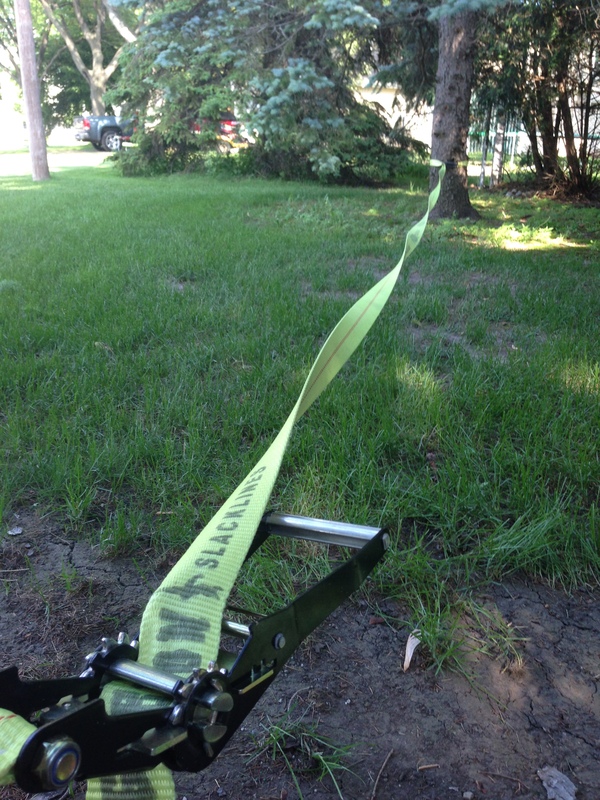 I now had successfully set up my slackline! 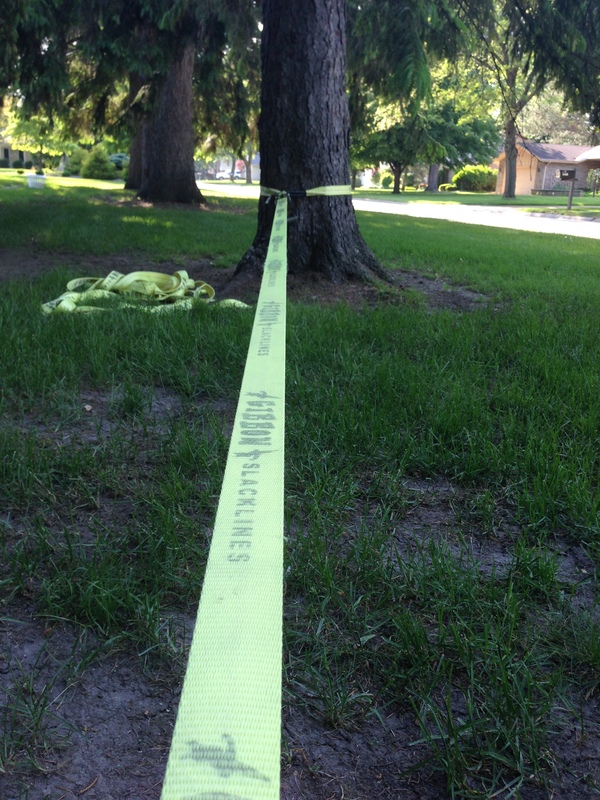 Now that I learned how to set up my slackline, it was time to begin actually learning how to use it. I used this video to get an idea of where to begin. This was a good video for beginners since it gave great pointers and slowly took you through the process step-by-step. This video then said to stand on one foot for five seconds and balance, then step on the line with the other foot. It also warned that the line would shake. 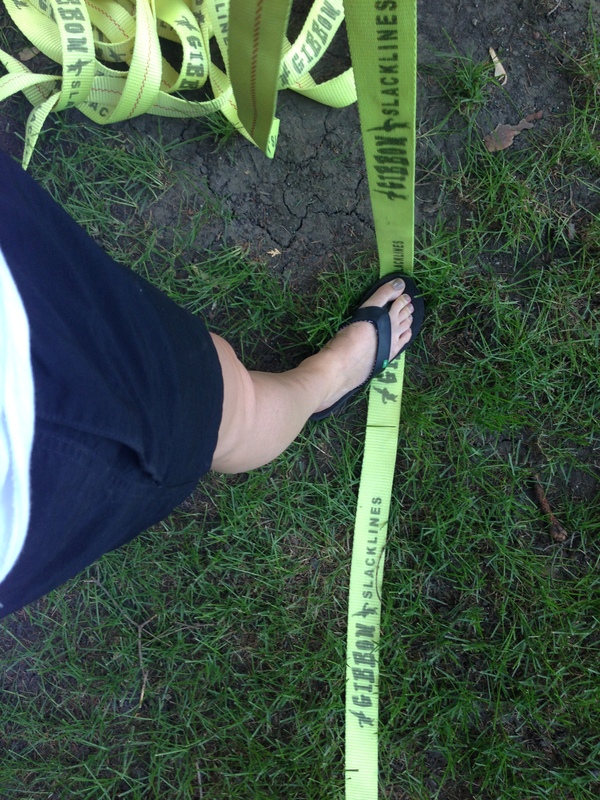 I stepped onto the slackline with my left foot. I didn’t even have my right foot off the ground and the line started shaking uncontrollably. All of the video tutorials I watched gave the same advice for how to start. This website suggested that if you are having a hard time starting, to have a friend walk beside you and you can use them for balance. I tried this method just to get used to the feel of walking on the line. After practicing for several days using someone for balance, I finally discovered a method that worked for me. 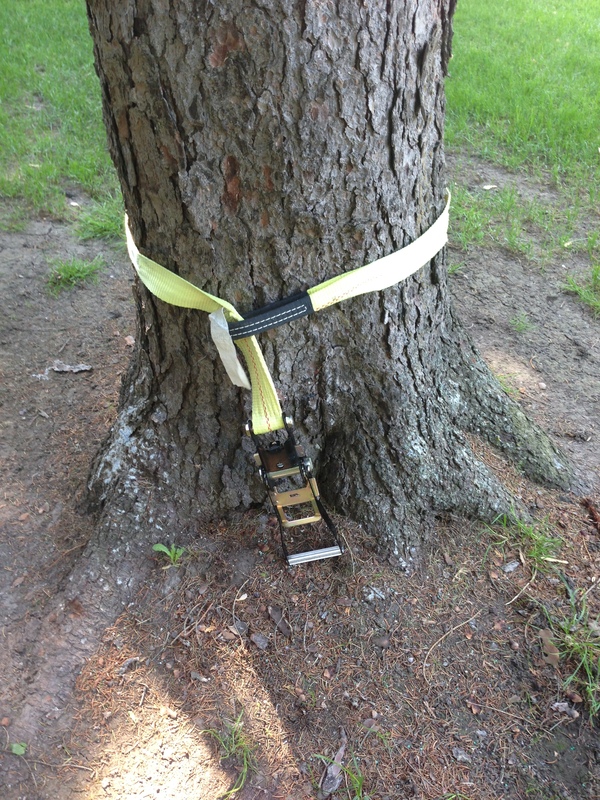 I began standing on the slackline with both feet while using the tree for balance. I’ve only managed to take a few steps so far and have to walk quickly, but I am making progress! After I become comfortable with this method, I will go back to trying the method the videos suggest of getting onto the line with one foot and slowly walking and balancing my way across.